The search for three more Malawi Defence Force (MDF) soldiers and two civilians who are feared dead in Bua River ended in vain yesterday as troops deployed for the exercise only recovered one body yesterday morning. When we visited the scene yesterday, troops were seen conducting a search with gloomy faces while onlookers who gathered at the bridge observed quietly. The soldiers were later seen packing their belongings in cars before leaving the area where they camped. MDF spokesperson Major Paul Chiphwanya confirmed in an interview that only one body out of four was recovered yesterday. Witnesses The Nation spoke to testified that they saw six soldiers swept by running water while two others were seen cramped down by metals while crying for help from pedestrians and motorists. Stella Kambavi, a witness, said the incident occurred around 4pm as the bridge the troops were dismantling suddenly collapsed. 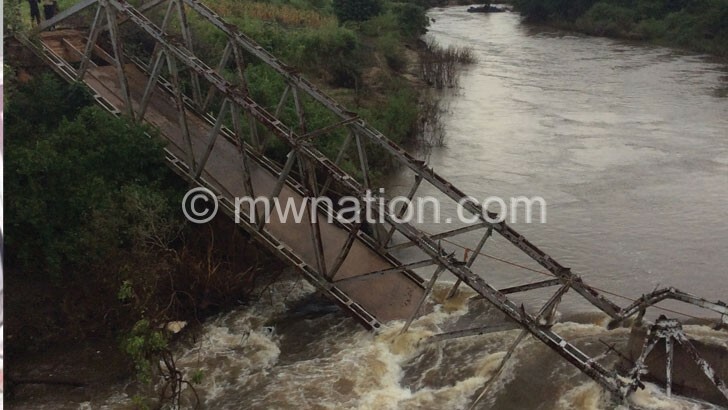 Another witness, Wilson Sanders, whose house is about 70 metres from the bridge, also narrated that he saw a number of soldiers in pain while some were helplessly swept with debris in the fast running river which flows into Lake Malawi in Nkhotakota. As the recovery team was working, there was heavy rain, thunder and lightning which halted search operations for a while. Chiphwanya said the troops will continue searching for the missing soldiers until they are found while the body of the deceased, whom he identified as Warrant Class Officer Laurent Ulanga, was taken to his home village for burial today. Ulanga came from Nkhata Village, Traditional Authority Tembera in Salima. According to Chiphwanya, some of the four injured soldiers are receiving treatment at Kasungu District Hospital while others were treated as outpatients on Sunday night. The development has since left the entire surrounding community in deep shock. It has also halted their businesses which to the larger extent were patronised by soldiers who were seen leaving the camp for Kasungu Boma.